Sailing Luna Sea : Living aboard - Hello Spring! And a lesson on Boat Corrosion. Fortunately, when we got the back plate off and started digging around inside the electronics of the gizmo, it was clear that there was some corrosion on these little pin things that we presume are the compass of the unit. Which would explain the random crazy turns the autopilot would throw at us out of the blue. Mark got it cleaned up and coated with Noalox. He got the screen installed - and viola! We can now see the display. We'll take her out soon (Hurry Up Spring!) and see if we need to re-calibrate her. Fingers crossed that this project is complete! Keeping those dang Sand Gnats out of Luna Sea! I'm still chugging along on the enclosure for the cockpit. It's made out of sand gnat proof screen and I'm really hoping to be 100% finished this week. As long as the weather holds and I don't cut anymore accidental holes in it... This weekend is supposed to be gorgeous, but with very little wind - so t's perfect sand gnat weather. I think that is it in regards to extra projects. We still have our weekly schedule of filling water tanks, cleaning water strainers, etc. But that's just standard life on a boat. So what's the big deal about corrosion/electrolysis? Well, here's my non-electrician take on it: Electricity is in water. It mixes with the salt water and basically creates a battery. 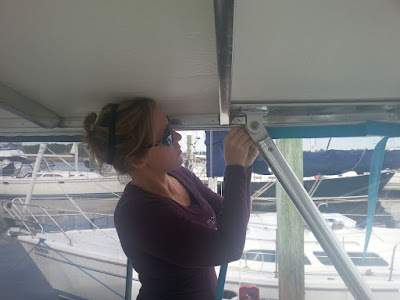 There are metals on boats - particularly thru-hulls (those holes that purposely let water into your boat for the engine and the A/C, and let water out of your boat from the sinks, showers, etc.) If your boat is not properly grounded, the metals (thru hulls, props, etc) will be eaten away by the giant battery... No bueno. Yes that is very simplified, and I may have used incorrect terminology in there. But hopefully you get the idea. Now it's time to whip up some vegan lasagna (sounds gross, right?) And hopefully we can enjoy cocktails in the cockpit this weekend - while we share an evil laugh at the sand gnats trying to get in. Of course I didn't catch allllll of that but I get the idea. Sure hope your update did the trick. I can hardly wait to get to come see everything you and Mark have done....... sometime......did the screen work??? I've had zucchini (?) lasagna and it was delicious.